We've heard over and over again that Pinterest is all for the ladies. TIME declared that "Men Are from Google+, Women Are from Pinterest" back in February, and in January Gizmodo published an article in January describing Pinterest as "Tumblr for Ladiez." Clumsy phrasing, but it is true that 72 percent of Pinterest users are female. One question women's dominance on Pinterest raises is whether it portends a larger female presence across social media. A new infographic from Information is Beautiful helps answer that question, breaking down every social networking site by gender. Some of the results are completely unsurprising. For instance, men account for nearly three-quarters of users of Reddit, a site known for it's less-than female-friendly content. 1. Pinterest is far from the only social media site dominated by women. Just look at Twitter: Sixty-two percent of Twitter's users are female, and each month 40 million more women visit Twitter than men. 2. Same goes for Facebook, but less so. Fifty-eight percent of The Social Network's users are women. 3. Despite users spending very little time on the network, people are still using Google+ -- and over 50 percent of those people are male. 4. Despite its user base declining steadily since 2008, people are still using MySpace -- and over 50 percent of those people are female. 5. Men make up the majority of users on music-based social networking sites, such as last.fm and Spotify. 6. More women are on Instagram -- but barely. The breakdown is 53 percent women, 47 percent men. 7. 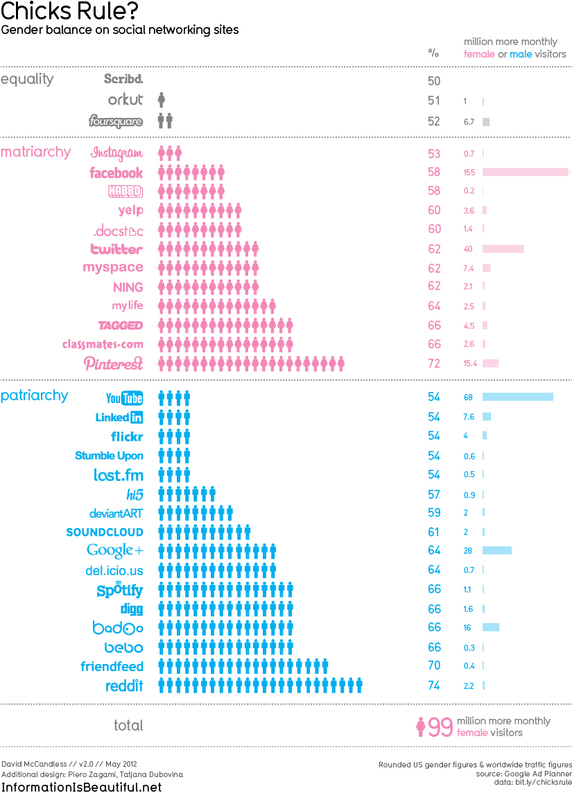 Only three social networking sites have gender parity: Scribd., orkut and foursquare.